Aswan International Airport (IATA: ASW, ICAO: HESN), also known as Daraw Airport, is an airport located 16 km southwest of Aswan, Egypt. It was built in 1956 and upgraded in 1992 and 1999 by the Egyptian government. In October 1963, a Soviet Union military transport plane crashed at the airport, killing 14 people. 20 March 1969, a United Arab Airlines Il-18 crashed while attempting to land at Aswan International Airport. 100 of the 105 passengers and crew on board died. ^ Airport information for HESN at World Aero Data. Data current as of October 2006.Source: DAFIF. ^ Airport information for ASW at Great Circle Mapper. Source: DAFIF (effective October 2006). ^ "مطار أسوان" [Aswan Airport] (in Arabic). Egyptian Airports Company. Retrieved 16 May 2018. ^ "Sphinx International Airport to operate its first internal flight - Egypt Today". Egypt Today. 26 January 2019. Retrieved 28 January 2019. ^ "Nile Air adds Jeddah from Dec 2018". RoutesOnline. 26 December 2018. Retrieved 26 December 2018. 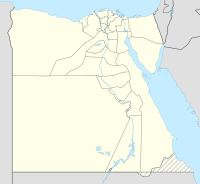 ^ "14 Die in Crash At Aswan Airport". The Press Democrat. Santa Rosa, California. United Press International. 21 October 1963. p. 9. Retrieved 16 May 2018 – via Newspapers.com. ^ "92 Arab pilgrims die in Aswan Airport crash". The Arizona Republic. United Press International. 21 March 1969. p. A2. Retrieved 16 May 2018 – via Newspapers.com. This article about an airport in Egypt is a stub. You can help Wikipedia by expanding it.